The Kulin Memorial Hall was erected in 1928 as a memorial to the men of Kulin who died in service or were killed in action in World War One. The hall was the venue for many dances and social events in Kulin through the depression years and into the Second World War years with wartime farewells and welcome homes, and the annual ANZAC Day service. The Volunteer Air Defence Corps, formed in 1942, used the Gentleman's social rooms as an observation post. The hall was available rent free to local fundraising bodies during the war. Many fundraising dances were held, as well as many balls such as the Debutante’s Ball and the Grand Ball, and school concerts. 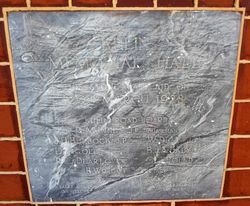 The foundation stone was dedicated to the soldiers on 20 March 1928 and the hall was opened by the Premier of Western Australia, Mr P. Collier on the 25th August 1928. The hall had been erected by the Road Board at a cost of £5000 and the architect Mr Eales announced that he had 100 medals struck to be presented to the Road Board with a request that they be given to schoolchildren as a memento of the occasion. The West Australian (Perth), 29th August 1928. This stone was laid on 20th March 1928.